India’s energy demand is increasing, and, to achieve its clean energy target of 175 GW by 2022, finance will be crucial. One promising opportunity lies with foreign and domestic institutional investors who have $70 trillion and $564 billion assets under management, respectively. These investors are bound by their fiduciary duties meant to maximize financial returns to their beneficiaries, without taking excessive risks, while also meeting their liabilities over the long-run. Renewable energy, though a relatively new technology, is well matched to these needs as it offers high returns as well as meets environmental, social and governance (ESG) considerations in their investment strategies. However, how can India unlock this opportunity to create a clean energy future? A recent study by Climate Policy Initiative attempts to answer this question by developing a business case for institutional investors to invest in the Indian renewable energy sector, identifying key barriers to investment, and proposing potential pathways forward. According to the report, the renewable sector is becoming increasingly attractive compared with other energy investment opportunities in India. For instance, the solar tariff has actually become 23% cheaper than coal plants, and coal plants exhibit greater risk in cash flows (i.e. 40%) as compared to wind (i.e., 20%) and solar (i.e.,10%). In the medium term, these changing economics mean that the existing power portfolio of investors, who are mostly exposed to fossil based investments instead of renewable investments, would underperform due to declining demand for fossil based power. Consequently, it is in the interest of institutional investors to gradually rebalance their portfolio in favour of climate friendly investments, in India and elsewhere. Is India an attractive renewable energy market for institutional investment? The study builds a case that India as a market is strong and economically attractive for foreign institutional investors compared to other similar markets across the world. First, it benefits from strong renewable policy commitments as well as a large market size — ~480 GW expected capacity addition over 2016-40 — that is third only to China and the United States. Second, India is ranked 2nd in Ernst & Young’s renewable energy country attractiveness index, based on five pillars including macroeconomic environment, policy enablement, supply–demand dynamics, project delivery, and technology potential. Third, renewable energy in India provides a financially attractive investment, as measured via excess returns, the difference between the expected return on capital invested and the weighted average cost of capital. India offers higher excess returns of 3.5% compared with other large markets, such as the US (2.4%) and China (1%). While some markets provide higher excess returns than India—for example, Mexico, Canada, and Chile – these are much smaller markets. Institutional investors with long-term investment horizons are mostly seeking yield generating investments in low risk and long duration assets, i.e., traits that align well with the current investment profile of renewable energy; this has changed from small size and high risk-high return investments to large size and medium risk-moderate return investments. Although the expected return from renewable energy projects have come down from 20% to 15% over time, this still matches institutional investors’ overall India market portfolio return requirements. However, our study finds there are still some barriers to unlocking this apparent match – including, sector specific risks like off-taker risk and limited listed and highly graded investment opportunities, along with currency risk. The good news is that with appropriate regulatory and policy changes, the sector can provide a high match with institutional investors’ investment objectives. For example, the central and state agencies could address the off-take risk through a transparent and credible payment security mechanism. 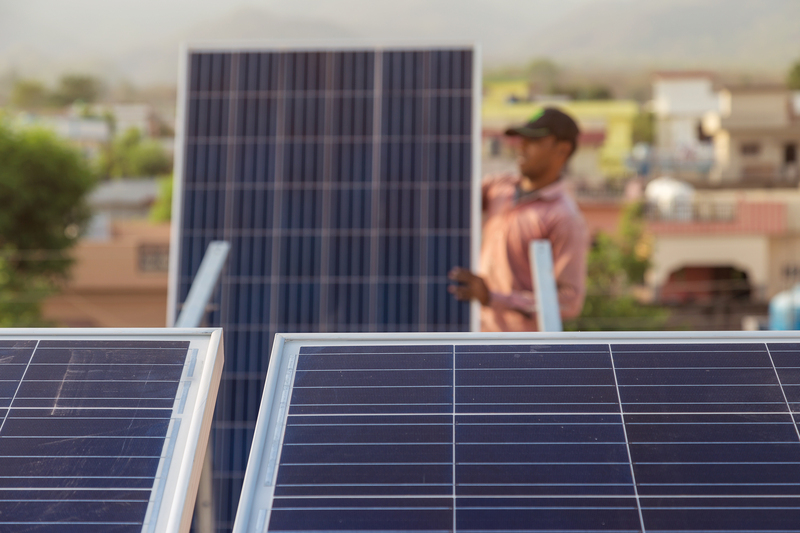 Regulators could consider developing incentives to encourage banks and Non-Banking Financial Companies (NBFCs) to securitize their renewable energy loan portfolios, freeing up capital for more renewable energy projects. And investors themselves can consider developing risk management frameworks to assess and manage climate risk, identifying and investing in forward looking investment opportunities, renewable energy being one, to mitigate climate risk in their portfolio. These steps, and the others we outline in the study, are a win win for all – for India, it’s a way to get much needed capital in a much needed area. For investors, their long-term portfolios depend on it. Last week, I was in Marrakesh speaking at this year’s UN climate change conference, COP22, where I witnessed an important transition in moving from talk to action. Just a few weeks before the start of COP22, the Paris Agreement officially entered into force – the historic international agreement for action on climate change that emerged from COP21 last year. While COP21 was about promises and commitments, COP22 was about working out the details to put those promises in place. Under the Paris Agreement, India has pledged that renewable energy will be 40% of the country’s expected electricity generation capacity in 2030, along with a 35% reduction in carbon intensity by 2030 from 2005 levels. In addition, India has also set one of the most ambitious renewable energy targets of all – 175 GW of renewable energy by 2022, including 100 GW of solar power. These important targets are not only good for the climate, but can also help meet the energy demand of India’s rapidly growing economy and population. However, a lack of sufficient financing for renewable energy in India may present a formidable barrier to achieving these targets. This was a key item of discussion at COP22. An upcoming report from Climate Policy Initiative shows that in order to meet the target of 175 GW of renewable energy by 2022, the renewable energy sector in India will require $189 billion in additional private investment, a significant amount. The potential amount of investment in the renewable energy sector in India is $411 billion, which is more than double the amount of investment required. However, in a realistic scenario, the amount of investment expected falls short of the amount required by around 30%, for both debt and equity. In this context, and as India moves to implement its commitments under the Paris Agreement, the work of the India Innovation Lab for Green Finance is increasingly important. The India Lab is a public-private initiative that identifies, develops, and accelerates innovative finance solutions that are not only a better match with the needs of private investors, but that can also effectively leverage public finance to drive more private investment in renewable energy and green growth. The India Lab has recently opened its call for ideas for the next wave of cutting-edge finance instruments for the 2016-2017 cycle, in the areas of renewable energy, energy efficiency, and public transport. Interested parties can visit www.climatefinanceideas.org. The deadline to submit an idea is December 23rd. The India Lab is comprised of 29 public and private Lab Members who help develop and support the Lab instruments, including the Indian Ministry of New and Renewable Energy, the Ministry of Finance, the Indian Renewable Energy Development Agency (IREDA), the Asian Development Bank, the World Bank, and the development agencies of the French, UK, and US governments. In October 2016, the India Lab launched its inaugural three innovative green finance instruments, after a year of stress-testing and development under the 2015-2016 cycle. They will now move forward for piloting in India with the support of the Lab Members. The three instruments include a rooftop solar financing facility, a peer-to-peer lending platform for green investments, and a currency exchange hedging instrument. Together, they could mobilize private investment of more than USD $2 billion to India’s renewable energy targets. Now that the Paris Agreement has been ratified and the real work begins, the India Innovation Lab for Green Finance can help India transition from talk to action by driving needed private investment to its renewable energy targets. Visit www.climatefinanceideas.org to learn more and submit your innovative green finance idea by December 23rd. As India prepares to meet its increasing energy demands, which will likely double by 2030, the government has set a path towards ambitious renewable energy targets of 175GW by 2022, and likely 350GW by 2030. These targets are good for the Indian economy, the climate, and the 400 million Indian citizens who currently lack access to electricity. Raising enough finance will be an essential piece of achieving these targets. Currently, it’s estimated that reaching the 2022 targets would require USD $160 billion. Domestically, India faces a shortage of available capital for renewable energy projects. The Indian government has stated several times, most recently at the Paris climate talks, that, in order to meet these targets, a significant portion of funding will need to come from foreign sources. At the same time, the governments of developed countries are willing to provide some of this capital, but would also like to leverage their public-sector spending, by attracting private investment to renewable energy. Indeed, greatly scaling up investment from the private sector will be essential to mobilize the full amount of capital needed to meet India’s renewable energy targets. However, private foreign investment in renewable energy projects in India faces two key barriers: currency risk and off-taker risk. To address both of these major risks, there are potential short-to-mid-term solutions that can both drive private foreign investment and leverage public finance from Indian and foreign development institutions and governments. Because currency exchange rates can be volatile, when a renewable energy project is financed by foreign capital, it requires a currency hedge to protect against the risk of currency devaluation; otherwise, foreign investors risk losing their gains due to depreciations in the Indian currency. However, longer-term currency hedges (beyond three to five years) are not easily available in the Indian market. In addition, market-based hedging in India is expensive (for example, 7% or higher for a ten year hedge), ultimately making foreign financing just as expensive as domestic financing. One solution to currency risk could be currency hedging sponsored by the Indian government. Recent analysis by Climate Policy Initiative shows that a government-sponsored currency hedging facility, if designed appropriately, could not only provide long-term hedges (ten years) but also reduce the hedging costs by up to 50%. To do so, this standby facility, in order to reach India’s sovereign credit rating, would need to be approximately 30% of the hedged capital. The second major barrier to foreign investment is off-taker risk. In India, the major off-takers are the public sector electricity distribution companies (DISCOMs), which are in a precarious financial situation. Because of the financial state of DISCOMs, investors are concerned that the DISCOMs might default, jeopardizing their investment. One solution to mitigate off-taker risk could be a payment security mechanism which would cover payments to investors in case of potential defaults. This would significantly reduce the perception of default risk and encourage foreign investment, thereby improving the availability of foreign capital. Climate Policy Initiative’s analysis shows that payment security mechanisms would need to be approximately 7% of capital expenditure to cover defaults over one year. The Indian government is in the best position to manage both currency and off-taker risks. For currency risk, macroeconomic conditions are key drivers of currency movements, and government policy can influence macroeconomic conditions. For off-taker risk, the DISCOMs are public-sector entities, essentially supported by the government. Therefore, the Indian government and public finance should play a significant role. The Indian government can use some of its own money to fund the currency hedging facility as well as the payment security mechanism – for example, from the National Clean Energy Fund, or from the expenditure budget. The international community can pitch in by not only supporting technical assistance but also contributing funds to these facilities. For the currency hedging facility, there may also be gains from diversification by creating the facility for multiple currencies, given that currency movements will likely offset each other. The international community can also help by creating political will around this process of creating these facilities. This would require key engagement from government stakeholders from both developed countries and developing countries, in addition to development finance institutions like the World Bank, Asian Development Bank and the Asian Infrastructure Investment Bank. As we move forward with the historic climate agreement that emerged from COP21 in Paris, there has never been a better or more important time to develop and implement the solutions that can drive the required finance to India’s renewable energy targets. The Indian government, governments of other nations, development finance institutions, and private investors all have key roles to play in moving these targets from dreams to reality. In order to achieve India’s renewable energy targets of 175 GW of solar and wind power by 2022, approximately USD 100 billion of investment in renewable energy infrastructure will be required, including USD 70 billion of debt. While these ambitious renewable energy targets are important and admirable, financing them is going to be no easy task. Renewable energy in India has traditionally relied on domestic commercial banks for financing; however, this bank financing has become constrained by several limitations. Many banks are nearing their exposure limits to the power sector, and existing regulations do not distinguish between lending to fossil fuel-based power and renewable energy. In addition, the typical tenor of bank loans is around ten years, whereas most renewable energy projects require longer-term financing that matches the project life cycle of 20 to 25 years. Finally, bank debt at 12-13% interest rate is also costly; and together these inferior terms of debt – the high cost, short tenor, and variable interest rates – make renewable energy in India approximately 30% more expensive than in the US or the EU. Achieving India’s renewable energy targets is going to require mobilizing a lot more debt at more attractive terms, from alternative sources. One promising solution is domestic institutional investors, such as insurance companies and pension funds, who are ideally positioned to both increase availability of debt and provide debt at more attractive terms to renewable energy projects. Compared to commercial banks, institutional investors not only invest over longer terms, but also accept lower returns in exchange for lower risks, thus providing a better match with the risk-return profiles of renewable energy projects. Preliminary analysis by CPI, performed earlier this year, shows that these institutional investors are likely to invest approximately USD 400 billion from 2014 to 2019. Based on their traditional share of 3.75% of their investments going to the power sector, if this share could be diverted to renewable energy, that would provide USD 15 billion of debt financing – a significant amount of the debt required to meet the targets. So, what’s the catch? First, given high risks during construction, institutional investors, who prefer low risk, are unlikely to invest in renewable projects before they start operation. Second, even for operational projects, institutional investors require a domestic debt rating of AA or higher, which most renewable energy projects do not have. The first issue is manageable – domestic banks can continue to fund projects under construction, and institutional investors can help refinance operational projects. This would free up bank debt to be used for new projects. As to the second issue – enabling institutional investment will require financial instruments that can raise the credit rating of renewable energy projects. There are two promising instruments that may be able to do this: infrastructure debt funds by non-banking financing companies (IDF-NBFCs) and renewable energy project bonds with partial credit guarantees (PCGs). IDF-NBFCs are pooled investment vehicles designed to facilitate investment across infrastructure sectors, including renewable energy. PCGs are a form of credit enhancement where the borrower’s debt obligations are guaranteed by a guarantor with a strong credit rating. Both of these instruments can reduce risks to meet institutional investors’ minimum requirement of an AA rating. Compared to commercial loans, they have the potential to provide provide more attractive terms of debt by lowering the cost of debt by up to three percentage points, and increasing the tenor by up to five years. However, both instruments face structural and regulatory issues which have impeded their use as investment vehicles. We identified three of the key issues that, if addressed with the right policy changes, could enable institutional investment in renewable energy. First, for both instruments, the domestic debt market does not differentiate between construction and refinanced loans, making it hard for banks to release debt for refinancing. This can be addressed by encouraging public banking institutions to provide loans during the construction state of renewable energy projects, in order to catalyze the construction debt market. Second, IDF-NBFCs require a three-way agreement between the project developer, the project authority (usually state-owned power distribution companies called DISCOMs), and the IDF-NBFC. However, in India, the poor financial health of DISCOMs presents a risk. The government can mitigate this risk by creating a model agreement for IDF-NBFCs which includes government guarantees for off-taker risk and robust termination provisions. Third, for renewable energy bonds with PCGs, existing regulations limit institutional investors to investing in only up to 10% of the bond offering. This would require more than ten institutional investors per bond offering, which is difficult given associated transaction costs and the small number of institutional investors in India. Relaxing this regulation so that investors could subscribe to 25-33% of the bond offering would help address this barrier, making it possible to raise the required debt from only three to four institutional investors. By taking these three steps, the government of India may be able to make significant progress towards financing India’s renewable energy targets, by harnessing the potential of institutional investment into renewable energy.